Home Current Affairs Who will pay for Britain's high speed lines? Who will pay for Britain's high speed lines? The land values issue can crop up at almost any time in almost any context. An example that is coming to public attention concerns proposals for the construction of high speed railway lines in Britain. A government announcement is expected shortly. Does this herald a bright new future? Many enthusiasts for such projects see them as good in themselves. Cost estimates are under-stated. Estimates of income from future traffic tends to be over-optimistic. The financial consequences elsewhere in the rail and other transport systems are glossed over. Above all, there is little understanding of the process whereby the rise in land values which improved infrastructure brings about is liable to be lost to landholders who seemingly effortlessly reap the benefit of others' labour and provision of capital. This windfall of external value is largely ignored because there is at present neither the political will to capture it, nor an understanding of how it might be effectively achieved. But the harm goes further. No-one knows whether or not land values are optimised by the kind of routing of this type of high speed train - as compared to alternative infrastructure investment such as urban light rail systems. And if they were optimised, should these values not be collected for the public good, and if so, how is this possible and practicable? regional funding - but which is unlikely under current arrangements to stretch very far. There is also likely to be some scope to realise major property value uplifts in the vicinity of HSR stations and these could be used to defray some of the capital cost. The extent to which property gains will materialise is largely dependent on the availability of developable land at station locations as well as economic recovery of the property sector. It should be realised that the values are unlikely to be on the scale available to HS1, which was developed to both serve and exploit the Thames Gateway. This reveals several things. All the external benefits of infrastructure developments eventually turn up in the shape of enhanced land values. These would automatically be captured if a system of land value taxation (ad valorem taxation of the rental value of land) were in place. As advocates of infrastructure development, Greengauge should be aware of this. If they want their project to go ahead, pushing for the implementation of this tax reform gives them the best chance of getting the schemes to happen. Except that the land value enhancement may or may not justify the investment and some forecast of the impact of the project on land values is a good indication as to whether it is good value for money. The second point is revealing and borne out by French experience. 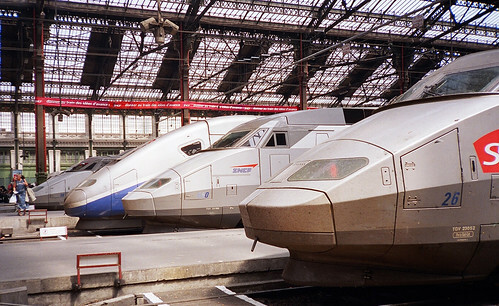 High speed rail will be competing for funds against other transport investment. We may end up with a wonderful high speed network and large tracts of the country deprived of any train services at all.